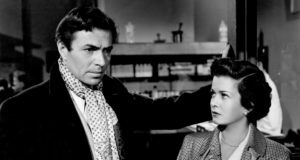 Saturday 26th May saw a very special event at Birkbeck cinema: the launch of Sarah Thomas’ BFI Film Stars book on James Mason, accompanied by papers from Thomas and Adrian Garvey, and a presentation of a rare 35mm print of Max Ophüls’ classic noir-melodrama The Reckless Moment (1949). 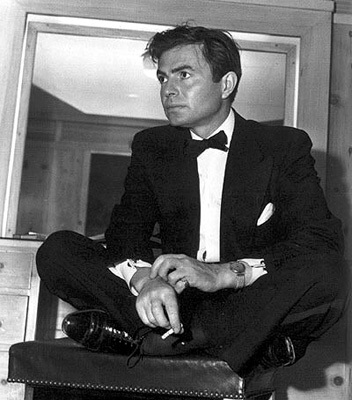 In front of a room packed with Mason aficionados, Adrian Garvey put James Mason’s career in both the British and American film systems in context, placing him as a ‘homme fatale’ standing in contrast to the more familiar ‘femme fatale’ of noir studies. Garvey traced Mason’s history from bit-part tough in Gainsborough melodramas to romantic leading man in Hollywood productions to the return to his villainous roots in films such Alfred Hitchcock’s North by Northwest; what emerged was a portrait of Mason a figure of both dreamy romanticism and doom-laden danger, a simultaneously suave-and-coarse man-of-the-shadows whose hypnotic effect on the heroines and anti-heroines of melodrama and noir was every bit as strong and pungent as the kind Barbara Stanwyck and Lauren Bacall cast over their male marks. Mason, as Garvey made clear, could be curiously classless and an embodiment of upper-class English manners and mores, a creature of immaculate self-control or a simmering pot of barely-containable emotion and impulse; a cleaner breaking of Mason from the stereotypical view of his on-screen persona and the ever-familiar impressions could not have been made. Following the first talk came the screening of The Reckless Moment. As explained in the speeches and discussions before and after the film, Ophuls’ here was trying to work in an American mode, more contained and stark than the lush and extravagant melancholia-romance of his famous European masterpieces La Ronde, The Earrings of Madame De and Le Plaisir etc. The intention was to produce a sort of work in the vein of “Brief Encounter” (a British rather than American production, but one that enjoyed great success in the States), yet Ophuls’ film is darker, more interested in the spilling over of the shadowy machinations of the underworld into the spotlessly-tormented American upper-middle-class suburbia than in the burn of unrequited love; the ambiguous romance plot is treated almost perfunctorily by Ophuls at times in favour of establishing an overall mood of desperation and strained-sinew despair, personified beautifully by Mason at his most downcast and regretful. While The Reckless Moment is not as expansive as the aforementioned European works, Ophuls nonetheless directs with his usual flair, his camera movements fluid and deeply-physical in the glistening beauty of the 35mm print, which, by all accounts, added a new sheen to a film deeply-familiar to much of the audience, revealing a new atmosphere, an immersivity in its seaside setting that made the mild salt air and the suffocating, warm closeness of the suburban home almost tangible. Following the screening a discussion was held between the two panellists and the audience, clearly enjoying their chance to see Ophuls’ film in such quality and to share their passion for Mason with two experts, and the event culminated in the talk by Sarah Thomas. Thomas focused on the little-discussed late career of Mason and his starring roles in diverse and often European co-funded films such as the 1966 John Le Carre-adaptation The Deadly Affair and the 1975 Italian half-Giallo The Flower in His Mouth. In discussing these rarely-seen works, Thomas made clear the intersections of violence, politics and passion in Mason’s later work, and the way that film-makers drew upon his aging to reposition him as a man caught between collisions of the personal and the political, particularly in relation to the devotion to, compromises involved in, and the abuse of positions of power. The Mason we see as a result is not so much a star let down by the poor roles he could take due to declining fortunes (as is the common reading of Mason’s career), but an actor who found unique and challenging ways to develop and build upon his youthful on-screen persona, to advance his ambiguous, ambivalent and shadowy character and begin to suggest new networks of power behind his motivations and actions. Following the talk a drinks reception was held to celebrate the recent publishing of Sarah Thomas’ book.